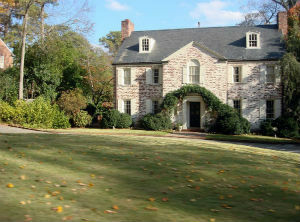 Just outside downtown Greenville is the neighborhood of Cleveland Forest, a residential community that wraps around Cleveland Park. The homes here have a broad assortment of architectural styles with a touch of European flare. This is an established neighborhood with mature trees and a quaint atmosphere, there is plenty of natural and scenic beauty throughout. Lush greenery is abundant, typical of this area of South Carolina. Maintaining an active and healthy lifestyle is easy with all the incredible park space surrounding this community. In addition to being close to Cleveland Park, there is also Falls Park, Greenville’s Swamp Rabbit Trail and the Reedy River nearby. Check out all of the homes for sale in Cleveland Forest below, or learn more about Cleveland Forest real estate. Cleveland Forest real estate is an older community with homes that offer plenty of character and charm. There are wide streets, manicured lawns, brick facades and large lots. Bungalows and 2-story homes are what make up this residential suburb. Residents of Cleveland Forest homes have all the luxuries of being in a calm and quiet neighborhood while being only minutes away from the hustle of downtown. There’s plenty of things to see and do being so close to Greenville's downtown core. There are over 90 restaurants to choose from, virtually all of them being locally owned and one of a kind eateries. Take an afternoon to visit the West End Market and Historic District, otherwise known as the arts and entertainment center of the city. This neighborhood is served by Sara Collins Elementary school, Hughes Middle School and Greenville Sr. High. Call RE/MAX Moves today at 864.757.4787. Or, contact us to learn more about homes for sale in Cleveland Forest and other Greenville neighborhoods. What are you waiting for!